When I receive a long text message I see the last part of the message first then I see the first part of the message last. This just started when I upgraded to the Note 9. Is there a setting that I need to correct? Following, as the same thing happens to me. That also tells me that texting has a maximum character count per text "bubble"
What does your screenshot have to do with the thread? I don't get it. As far as the question, I've had this issue on every Android phone. My guess it it's a limit of regular texting and/or the default texting app. Your "Guess" came from my answer. Maybe some people don't know what I mean as far as "Text Bubble". I'm not being rude, your screenshot just doesn't have anything to do with the topic. The topic is "Text Messages"
MY Answer> There's a maximum character count per text "bubble"
HAS EVERYTHING TO DO WITH THE "TOPIC"
And to be clear, my guess did not "come from your answer". You can see a character count in every single message you send once it's going to spill over to a second message, it's 140 characters per message. I said it's a limit with the app or the regular texting, meaning the technology behind it. It's not iMessage, which handles these things much better. It also probably has something to do with carriers as I've sent and received large messages to people on Android and they have different experiences based on carrier. Do you mean that the long message is cut into parts and the first message is the last part? Hmmm - the only time I seem to see something like that is when I send a long text to someone on Verizon. For some reason, Verizon cuts up long text messages and often they are not in the order of the message itself. I was told it had to do with CDMA limitations but not sure. Anyway, not even sure that if your issue - just throwing an idea in there. Then after seeing my answer, you basically reiterated my answer in you own answer that basically repeated mine. Look at the order of the thread before looking like a complete fool . . .
Maybe if you had not chose to criticize, you wouldn't have a foot in your mouth? You still make no sense, but get a grip. Stop being a delicate flower and move on. I asked a simple question as to why you posted a random screenshot of a text message that didn't contain the scenario the original post talks about and you got defensive right away, taking it as criticism. That says a lot. If you can't see the difference between my answer and yours, whatever. This will be my last post to you about it as I really don't care anymore, if you just have to be right and have the last word go for it. Now you're just "deflecting" - you criticize then try to cover up for yourself. Its a carrier thing, only so many characters are allowed per page of text. It's usually 160, I know some apps have a page counter as well. Sorry I have to agree with Berfles. Your screenshot lends nothing to this discussion. Yes it's a screenshot of text messages and text bubbles. But none of those text bubbles are a long message. The screenshot doesn't show a character count. 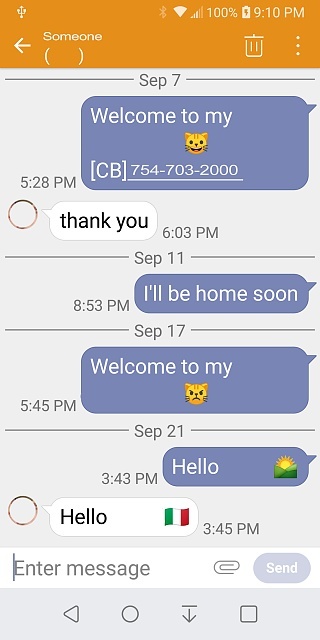 So to what purpose does it add to the discussion about long text messages being split up and then received in the wrong order? All I can guess is that you totally misunderstood what this topic is about. SMS Text messages do have a max size of about 150 bytes (150 single-byte chars or 75 Unicode chars). Some SMS apps will give you the option of (1) breaking long messages into multiple small pieces, or (2) converting the SMS message to MMS. While I have never personally experienced the incorrect ordering of the pieces, I get the impression that it happens when the carrier tries to do the conversion instead of the SMS app doing it, suggesting the problem may be on the sender's end. Stephen Martino: Apparently your comprehension level is as diminished as your friend Berfles - your rude comment offers nothing to this discussion. Please try to stay on topic in the future. When you guys have quite finished.........I have an unlocked note 8 since it came out. Samsung message app ALWAYS makes me open a second screen to see the second part of long messages - which is infuriating. That's one big reason why I use textra app. You'd think that if I can see a long SMS as ONE in textra then sammy could do it too ? Only problem is that textra messages can not be read on Samsung Gear S3 watch! Oh, and Aura, to be grammatically correct, you should have a comma following "Berfles"! Further, in place of your word "offers" you meant to say "contributes", I'm sure! shaimere, DanielLoreti, Mikey47 and 1 others like this. Is the time set correctly on your 9? ie are you on network time? Your device should be set to carrier network time. All your messages will then be in chronological order. You can read Textra on the galaxy watch. Just letting you know. mustang7757 and seetammy16 like this.